The 12th Cathedral Quarter Arts Festival kicked off last night with comedian Mark Steel in the Black Box and Abie Philbin Bowman in The Dark Horse. For the next week and a half, Belfast’s Cathedral Quarter will be alive with song, laughter, drama and chat. If you’re shopping in Belfast city centre over the long weekend (Saturday 30 April – Monday 2 May), watch out for Granny Turismo, the “world’s first (and only) formation shopping trolley dance team”. The Bank of Ireland on Royal Avenue will be hosting Multiple, a pop-up shop and exhibition of twelve local artists, open between 1pm and 8pm until 8 May. “Expect wry insights into the city as they present art ‘for sale’ as lo-fi commodities, collectables, souvenirs, posters and paraphernalia. Catherine Roberts of Budgie Butlins fame is one of the artists participating. noon – Writers Square – The May Day rally and march leaves Writers Square (opposite St Anne’s Cathedral) at 12.30pm after speeches at noon. After the march, Writers Square will host a Diversity Festival between 1pm and 5pm, an afternoon of music and entertainment. 8pm – The John Hewitt – Australian band Wishing Well. 1pm – The Black Box – The Silent Picture House “recreating some of the magic” of silent movies with a Buster Keaton / Laurel and Hardy double bill with live piano accompaniment. 5pm – Cotton Court – The Chipolatas are gagging musicians and billed as “a special kind of alchemy which rakes the base ingredients of music, rhythm, juggling and comedy to turn them into a show packed full of sheer joy”. 9am-5pm – Lagan Lookout – PLACE invites architects, city officials and creative thinkers to its CQ Charrette to work in cross-discipline teams to respond to a design brief and make a contribution to the Belfast townscape. 1pm – The Black Box – Northern Irish poet, Michael Longley. 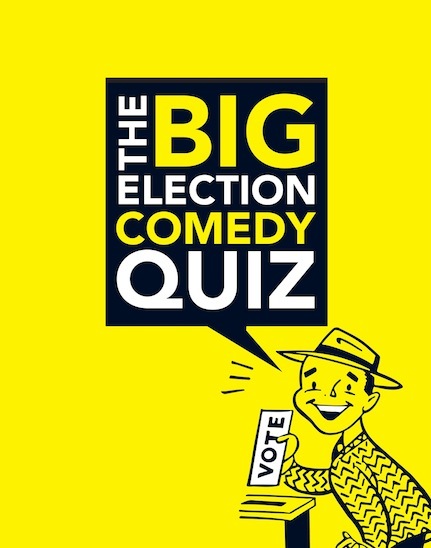 8pm – Duke of York – On the eve of the Assembly and Local Government elections and the referendum on Voting Reform, join Grimes, McKee and others in the Big Election Comedy Quiz as they “steer you through the (tri-lingual) Vote, Votail, Big Heid Coont”. 1pm – The Black Box – Dramatised readings from the works of Brian Moore. 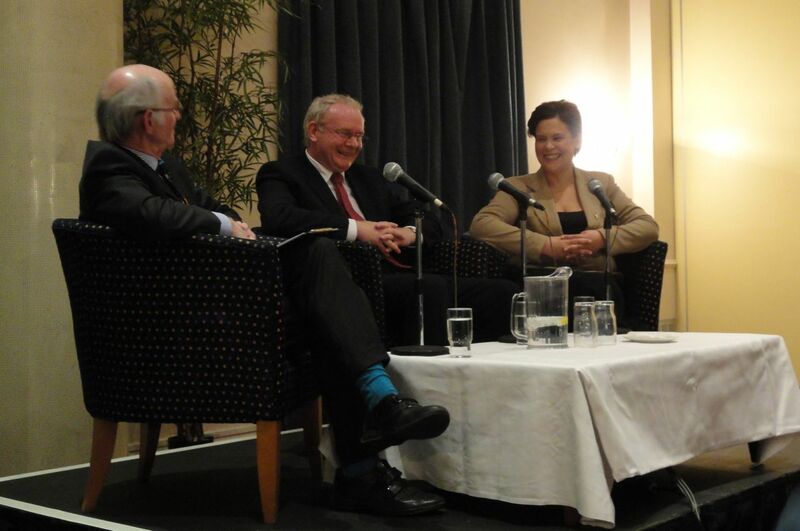 8pm – Oh Yeah Centre – The 4th Annual David Ervine Memorial Talk. As well as guest speaker and guest artists, awards will be announced for successful applicants to the David Ervine Foundation which supports “educational, training and/or personal/development opportunities to children and young people from socially and economically deprived background”. 1pm – The Black Box – John Boyne, author of The Boy in the Striped Pyjamas, will give the first public reading from his new novel The Absolutist which is currently Book at Bedtime on BBC Radio 4. 8pm – The Dark Horse – Poland 3 Iran 2 is part of Polish Cultural Week a conversation between Join Seyf and Dobrowolski about monumental historic events including the eponymous victory of the Polish football team in the 1976 Montreal Olympics. 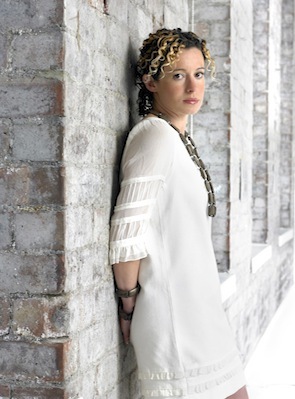 3pm – Festival Marquee – English folk musician Kate Rusby will be performing a family matinee in the Custom House Square tent on Saturday afternoon. Her 8pm evening show is now sold out. 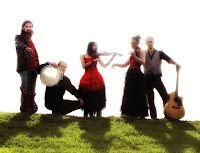 2pm – The Black Box – More folk music from much recommended local five piece band, The Rapparees. Stories that feature time travel are often confusing, but this tome takes the biscuit. I didn’t really understand the end of the book. To be honest I didn’t really understand much of the middle of the book. And while I’m not planning to immediately reread Charles Yu’s novel to see if it can all fall into place second time through, I did enjoy his tale about life as a time machine repairman. How to Live Safely in a Science Fictional Universe is the story of a young man living in a world that allows people to drop out of real life and instead pay to inhabit loops of time that they feel they would enjoy better. Charles’ mother is one such “victim” of this technology, serving dinner to her family on an hour-long loop. For years Charles’ father worked away in his garage, theorising on blackboards and engineering prototype time machines. While his father eventually disappeared without trace, Charles ended up in the time machine repair business, occupying a small cubby hole-sized craft with only TAMMY – its female operating system – and an imaginary dog called Ed for company. The base model TM-31 runs on state-of-the-art chronodiegetical technology: a six-cylinder grammar drive built on a quad-core physics engine which features an applied temporalinguistics architecture allowing for free-form navigation within a rendered environment, such as, for instance, a story space and, in particular, a science fictional universe. Or, as Mom used to say: it’s a box. You get into it. You push some buttons. It takes you to other places, different times. Hit this switch for the past, pull up that lever for the future. You get out and hope the world has changed. Or at least maybe you have. Of course, without family complications, time travel has many conundrums. The author’s prose dealing with the kind of abstract science fiction notions that time travellers would have to explore are amongst the highlights of the book. I get the key from the guy at the front counter. From his stationary, non-time traveling perspective, he sees me almost every day, only each time he sees me, I’ve aged a year or two or five or nine. I rented the room when I got the job, ten biological years ago for me. To him, it was last Wednesday. My whole life will probably amount to about a month’s rent by his calculations. Given that it’s explained on the back cover of the book, it’s not a spoiler to reveal that one of the major plot points is when Charles meets a version of himself stepping out of his time machine … and shoots him(self) in the stomach. Charles Yu has written a book of many layers. Underneath the science fiction is a story about the relationship between a son and his father, and the son’s search for his missing father. There’s an exploration of the mind of someone who works alone and receives instruction from computers. Typing this, and thinking back to reading the book, I wonder if it is partially autobiographical, or perhaps just meant to be the delusional thoughts of someone who spends their life hiding in a small box refusing to engage with the real world. A kind of Second Life becomes No Life? Worth a read if you like challenging science fiction. But it you like completely understandable novels, give it a miss or else you’ll be left feeling that part of the plot fell through the fabric of the grammar engine and into the author’s waste-basket. Tremendously cleaver... marvellously written, sweetly geeky, good clean time-bending fun. Update - My colleague Norwin has subsequently posted his musings on this book over on his blog. 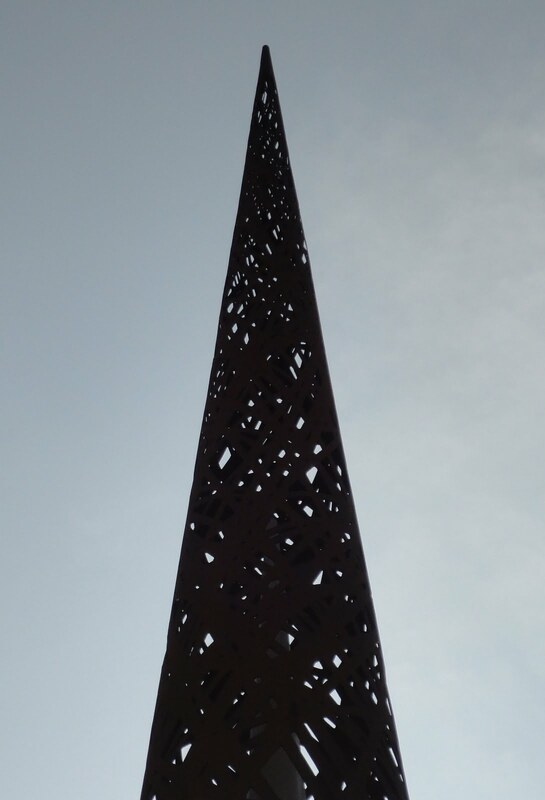 Wandering through Gloucester Docks this afternoon, we walked past a new piece of public art that wasn't there last summer. 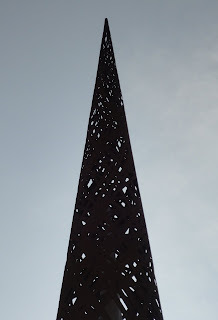 Rising high into the sky, the 22m tall "Candle" is known locally as "the Rusty Needle". The sculptor? None other than Wolfgang Buttress who is behind Rise ("the Balls on the Falls") which is in the process of being installed on top of Belfast's Broadway roundabout. 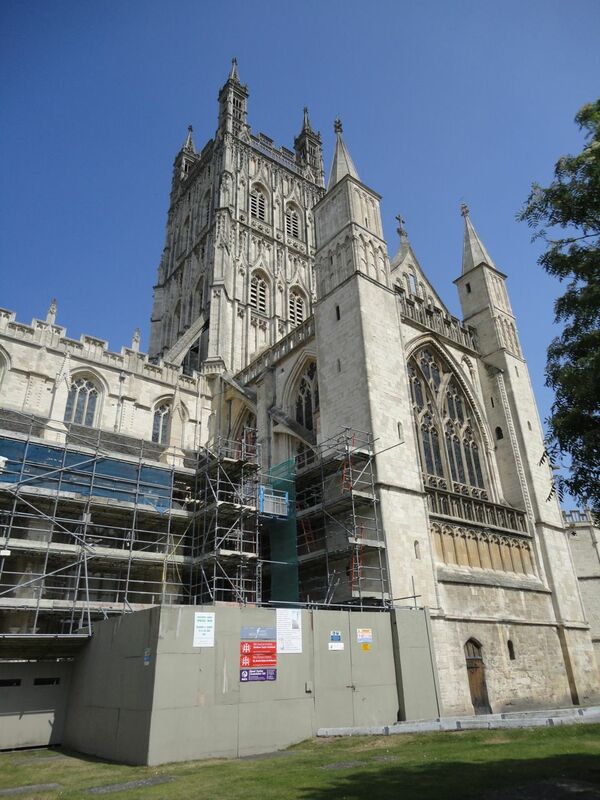 The Candle with its embedded spire complements the existing city skyline which includes Gloucester Cathedral and the tall warehouses (now offices and apartments) in the Docks. 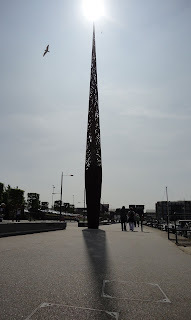 The candle or flame is also meant to be a reminder of the many fires that have occurred over the years in the docks. 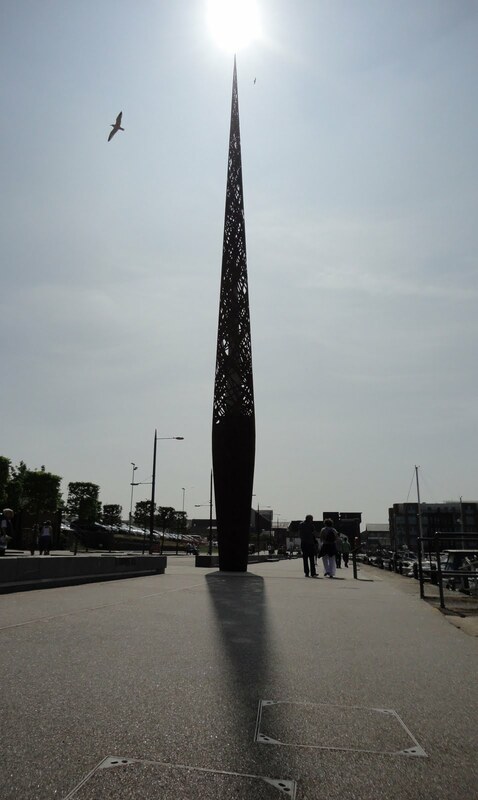 Around the base of the sculpture are the first few lines of Requiem by Ivor Gurney - a poet and composer who grew up in Gloucester. The panorama function of my camera - or perhaps my use of it! - had problems keeping the image straight! Two minutes of Grandsire Triples and Bristol Surprise Maximus, village greens, and ever so complicated technical introductions by continuity announcers. I can't ever remember hearing any BoS from Northern Ireland ... in fact, other than Hillsborough Parish (and Garnerville Presbyterian who have a speaker rather than bells in their tower) I've rarely heard the sound of bells locally. 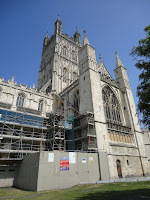 Walking through Gloucester city centre at lunchtime, we heard the bells of Gloucester Cathedral clearly ringing out. They were going a good hour or so. Surprisingly, take a couple of steps inside the cathedral and the sound of the bells disappears entirely. Bells on Monday ... sounds like the perfect name for a spin-off show on Radio 4 Extra! About four weeks ago, TEDx came to Belfast for the first time. You can read my review of the night's talks and sessions in a previous post. Three of the talks are now available to watch online. Ruth Morrow, is professor of Architecture at QUB [I posted last year about her inaugural lecture] and co-founder of Tactility Factory a spinout company that combines concrete with textiles to create softer surfaces. While a lot of education is about transmitting knowledge, she believes that architecture is transformative, developing the design process in people, and empowering students to change places and lives. Ruth talked about “making mad ideas sane”, reckoning that if you’ve faced difficult problems before, then you can approach new madcap schemes with a greater bravery and chance of success. She’s a believer that “critique is a sister of creativity”, of mixing contrasting materials and styles (“vinegar and chips” / linen and concrete), and of encouraging cross-fertilisation of thinking. Her final challenge to TEDxBelfast attendees (and anyone who watches the talks online afterwards) was to help develop a “Designed and Well Made in NI” branding that would expose products that are not just quality crafted but also have a strategic relevance and opportunistic fit in the market place, communicating value. Fundamentally Mark Dowds challenged why so many people continue to feel so unhappy and dissatisfied at work. Remarking that non-democratic countries are amongst the most corrupt, he suggested this could apply to companies and organisations too. His talk dovetailed well with an earlier one from Ken Thompson. Instead of employees continuing to arrive at work with long faces, he suggested that more democratic workplaces would offer greater employee satisfaction, productivity and results for their employers. He cited examples where senior managers had become facilitators, where HR policies had been thrown out the window, and where workplace democracy had led to sustainable growth. Paul Moore heads up the University of Ulster’s School of Creative Arts at Magee and holds a personal chair in Creative Technology. In his talk he rubbished the kind of city creative quarters and notions of a creative class espoused by academics like Richard Florida. As well as saying “the creative class is a con-trick”, he spoke out against “symbolic creativity”. Instead of believing in an creative elite, Paul explained his passion for the “bottom-up” creativity of ordinary people. He used local examples to demonstrate NI creativity, and pointed out the (not always originally foreseen) long tail of their work. The rest of the TEDxBelfast talks will appear online in a few days time. It’s amazing how changing the horizontal cropping of a photo can change the story it tells. If any AiB readers have ever wondered what’s to the left of Sinn Féin in the political spectrum but been too afraid to ask, then hop across my interview with éirígí council candidate John McCusker on Slugger O’Toole. It’s one of a series of interviews with representatives from smaller parties standing in the Assembly and/or local government elections. John explains why the socialist republican party is participating in the elections, what the party stands for, their stance on militarism as well as cooperation with the police. Or save yourself the read, and just watch the two clips from our conversation I’ve embedded below! 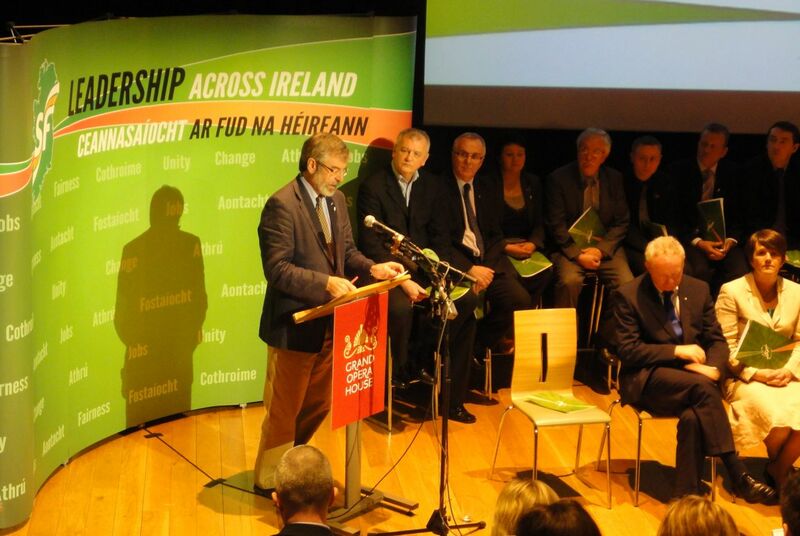 There’s a sense that éirígí’s manifesto stretches back a hundred years into the past and forward another hundred. éirígí’s long term goals are more important than short term fixes. It’s a very different mindset to that of most parties who are thinking no more than ten years (or ten minutes!) ahead to achieve their visions. It’s also a mindset that explores everything through the prism of history and socialist heroes like Connolly, in a way unionists do not match. In the end, to me, I found it to be a struggle without any obvious hope. But the West Belfast electorate may disagree. How does faith affect your work and decision-making? Contemporary Christianity’s next monthly In Conversation event is scheduled for next Tuesday, 19 April at 7.30pm in The Mount, 2 Woodstock Link, Belfast, BT6 8DD. Under a title of “Faith-sufficient for each day”, a “prominent leader in Northern Ireland public life” (who’s not a politician but has a high pressure and high profile role) will be sharing how his faith affects his work and decision-making. After the guest speaker shares his story, there will a time of questions. Tea/coffee and biscuits are promised at the start of the evening! It’s an open event – everyone is welcome – no booking required. For further information, contact info AT contemporarychristianity DOT net. Is it right to claim a dead man’s vote? When someone in the Wellington Park Hotel audience last night asked Martin McGuiness whether any “middle ranking or even junior members of Sinn Fein” had joined the PSNI, the last thing I expected him to comment on was his perception of Ronan Kerr’s voting record. 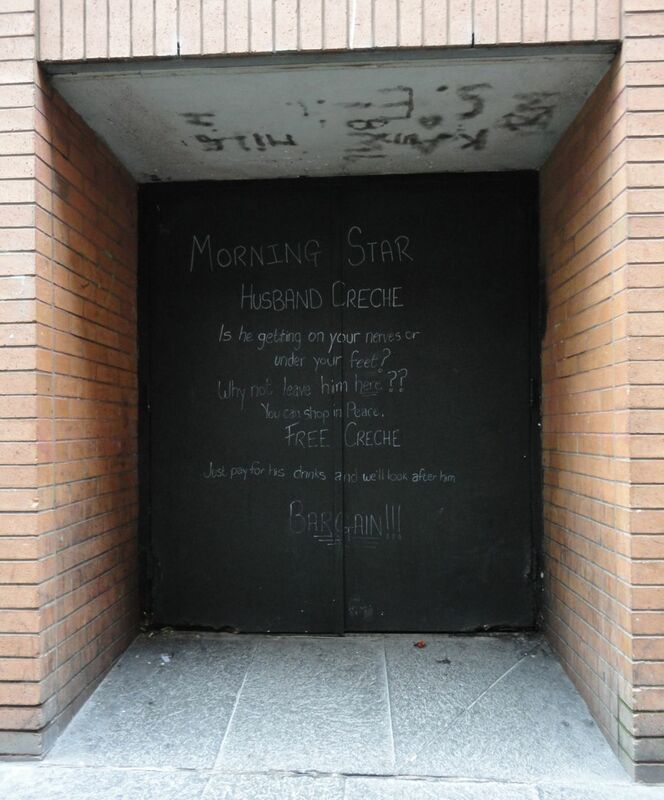 “I went down to see Nuala within hours of her son being killed. And it was very obvious from being in that household that many of the family circle were Sinn Fein voters. The exchange begins about 31 minutes into the audio clip embedded above. Later Martin McGuinness went on to say that he would be as outraged if a young protestant policeman was killed in the morning. But was it fair to politicise Ronan Kerr’s death by speculating on his politics? Update – The Belfast Telegraph topped and tailed the post on Slugger and ran it as their front page headline in Tuesday night’s paper. And both the Irish News and Newsletter picked up the story too. Following on the Assembly candidate nominations, we now know that Belfast East will have 17 candidates listed on its long ballot paper. 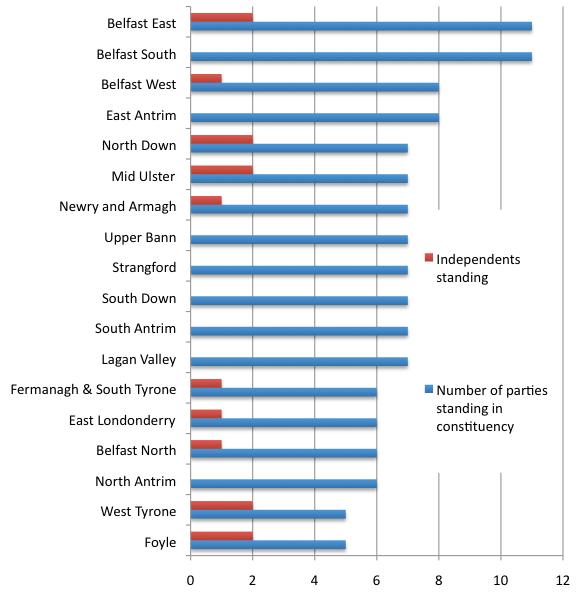 Belfast South and Belfast West are next largest with 14 candidates each. 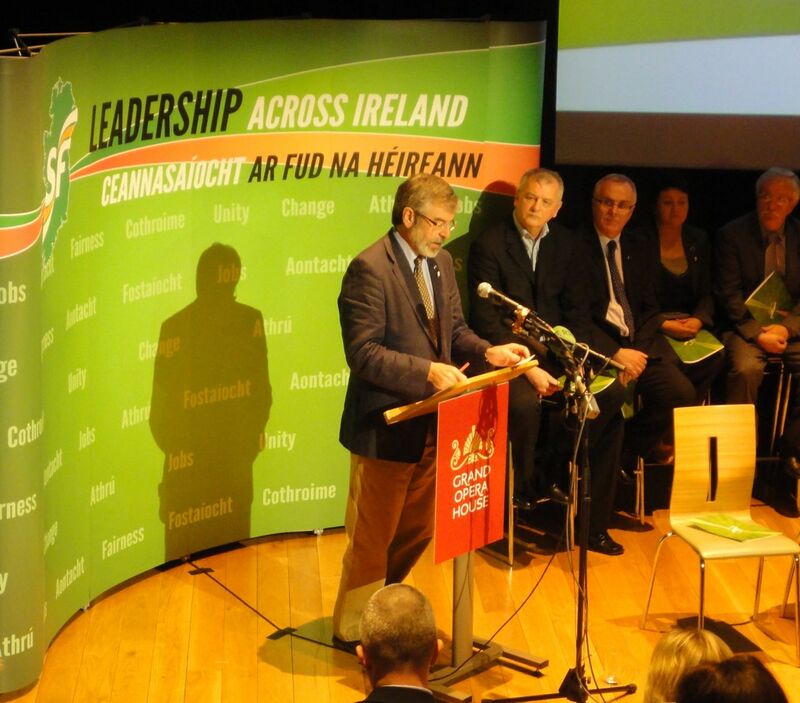 South Antrim will have the shortest ballot papers with only 10 candidates listed. 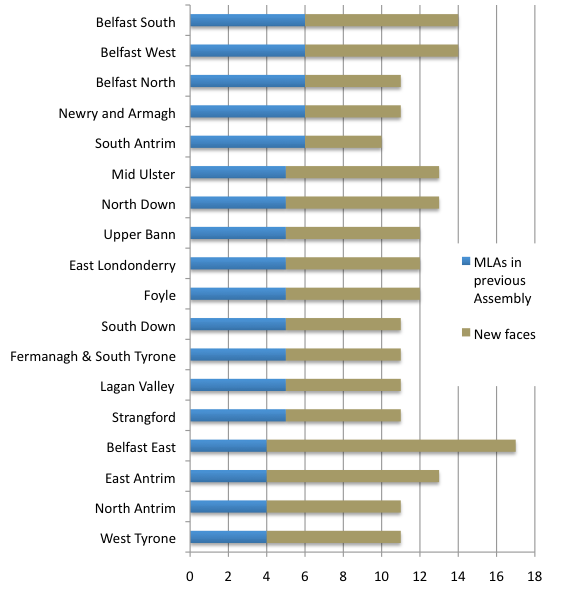 "The only constituency in which all six MLAs elected in 2007 are running again in the 2011 Assembly Elections is Newry & Armagh"
In terms of party diversity, Belfast East has 11 distinct parties standing along with two independents. 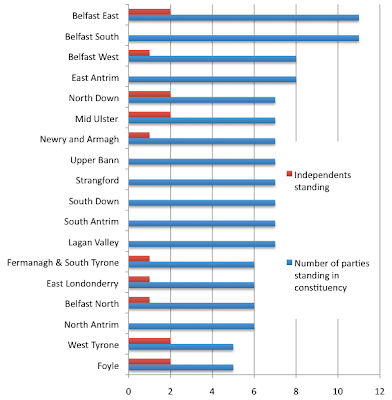 Similarly, Belfast South has 11 parties ... but no independents. 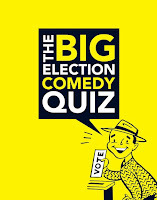 No constituencies have more than two independents on the ballot paper. West Tyrone and Foyle both have just candidates from five parties standing, and both have two independents on the ballot paper too. 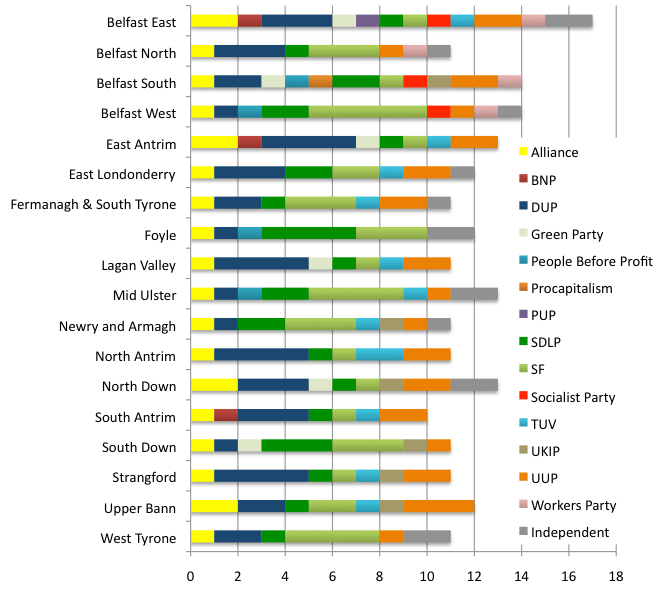 The DUP are running the most candidates (44), with Sinn Fein (40) not far behind. 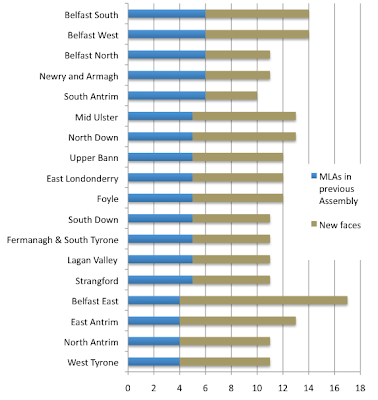 The UUP (29) and SDLP (28) are neck and neck. Alliance are running 22. In the chart above you can see how many candidates each party is running in each constituency. 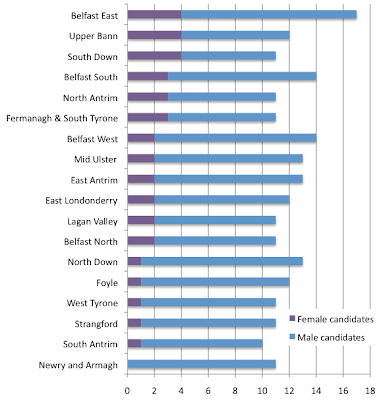 Gender wise, Newry and Armagh has no female candidates. Five constituencies only offer one female candidate. 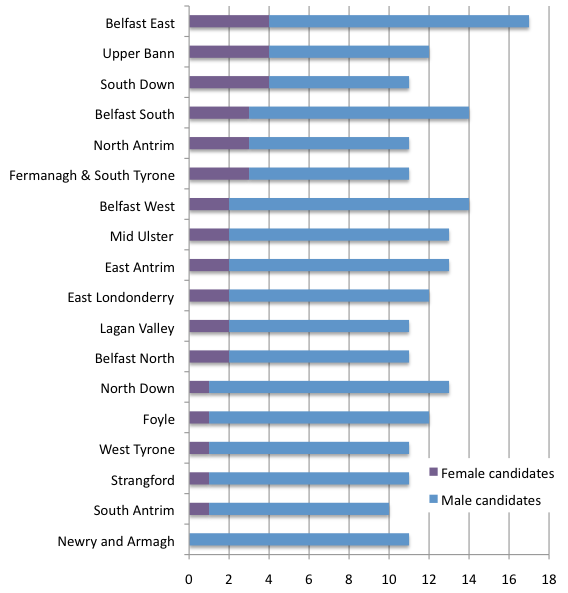 Belfast East, South Down and Upper Bann have four female candidates on the ballot paper. 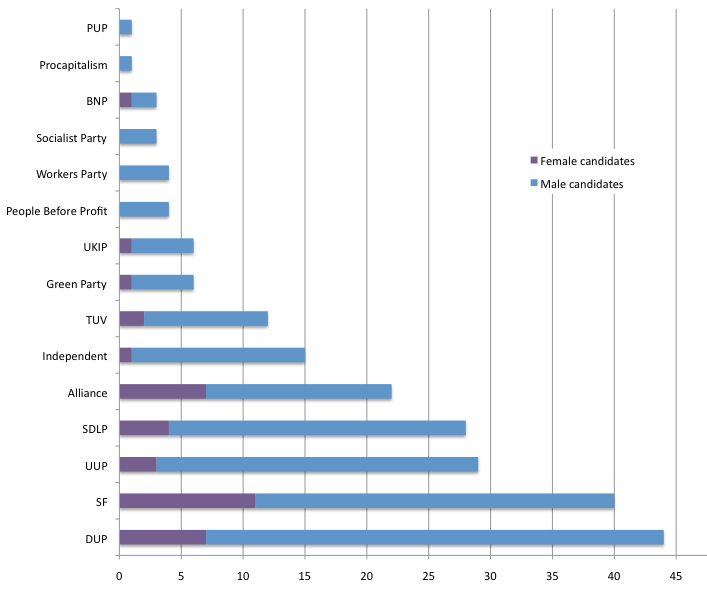 Technically, the BNP are running the highest proportion of female candidates (1 out of their total of 3 candidates = 33.3%). 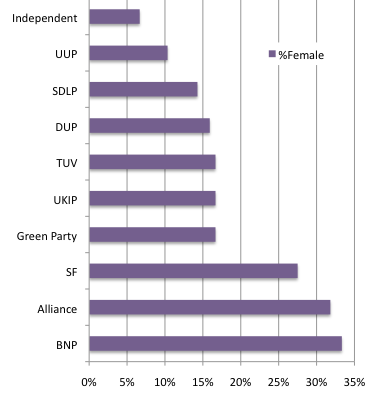 Alliance are next with 31.8% female candidates, then Sinn Fein (27.5%). Of the other main parties, the DUP is a mere 15.9%, SDLP at 14.3% and UUP lagging at 10.3%. A cast of four performed After Dresden’s first public reading a few Tuesday night's ago in front of an enthusiastic audience in South Belfast. Philip Orr’s play is inspired by reading Ray Davey’s wartime diaries which described the years he spent as a army padre looking after the welfare of British prisoners of war in and around Dresden. Davey returned to Northern Ireland after the war, and founded the Corrymeela community which is based in Ballycastle. The play tells the story of a similar fictional figure, Tom Moore. As padre of the prisons, he has a certain amount of freedom to travel around. He strikes up a friendship with a local woman Frau Klein, a dentist in a village outside Dresden and near the castle that holds many of the prisoners that Moore is responsible for. They bond as she pours out her heartache and the war-related tragedy in her family. Towards the end of the Second World War, refugees fleeing the advancing Red Army sought shelter in Dresden. Little did they realise that their most immediate threat was no longer from the east, but from the west and above. An older Moore, back in his community – The Rock – on the north coast of Northern Ireland encounters a young volunteer Siobhan for whom darkness and tragedy are a reality too through the murder of her brother some years ago. As they listen to each other’s tales, it’s apparent that both their stories are open-ended: experiences full of loss and grief, pain and sorrow. Emotions that are not quenched with fairy tale endings or neat resolutions. Through story telling, conversation, humour and song, the four inexperienced actors gave impressive performances during the two hour play. There are early plans to perform the play in Coventry next year: a city with close links to Dresden, and whose cathedral has a long-standing relationship with Corrymeela. After Dresden should have as strong resonances as they watch and listen, and examine their past in the reflection of Philip Orr's story. On Sunday evening Belfast Film Festival offered the bum-numbing experience of watching the 1959 black and white television series Quatermass and the Pit. Six half-hour episodes with a ten minute comfort break in the middle. A couple of people slipped out at the end of episode two, and a few went awol during the break. But around 40 of us invested the full three hours and stuck it through to the end. A skull is found on a build site. The resulting archaeological dig uncovers more remains of prehistoric hominoids before unearthing a large metal tube that turns out not to be an experimental unexploded German bomb. From there the plot introduces a mix of pentacles, ghosts, perceptions of black magic, some very dodgy pickaxe handling, alien arthropods with three legs, plates and bricks flying across the set and an optical encephalograph that shows a race purge on Mars. In the end, it turns out that Martians colonised the Earth five million years ago. And the history of poltergeist outbreaks around the building site were merely the product of Martian faculties implanted in human ancestors. 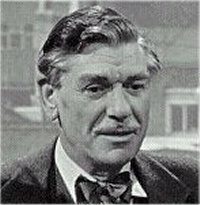 And once again, rocket scientist (about to turn government scientist) Prof Quatermass is around to analyse and advise. It's a funny word... worn out before anything turned up to claim it: Martian. The amazing thing is that a large amount of each episode was performed and broadcast live, with small segments filmed in advance and inserted into each episode as it was broadcast. Half an hour, six weeks on the trot. Televisual theatre. As science fiction goes, it’s pretty good. It descends from a normal building site, to an archaeological dig, to an alien invasion, and on to a psychotic city of London without difficulty, combining science with fiction, and without resorting to humour to cover the cracks. Having had a frustrating experience as a child reading a Quatermass novel which was missing its final page, and having enjoyed a repeat of the BBC Four “live” Quatermass Experiment remake, it was good to catch up with one of the original shows. One other observation is that as head of the British Experimental Rocket Group, the central character of Prof Bernard Quatermass reminds me a little of David Kelly, the British UN weapons inspector who died in 2003. Like Kelly, the fictional Quatermass wasn’t afraid to speak out and speak up about what he believed in, even if that means annoying civil servants and government minsters. Unlike Kelly, Quatermass perhaps dealt better with the resulting pressure. Still, I’ll give my vote* in May to the first party who will pledge to encourage more scientists to wear bow ties on an everyday basis. One of the joys of this year’s Belfast Film Festival is that the BBC are running free screenings of a variety of programmes from their archive. Tomorrow sees the return of Doctor Who and the City of Death and Quatermass and the Pit. Mother’s Day hasn’t prevented both screenings selling out. But this afternoon, a Play for the Day written by Northern Ireland born author and producer Maurice Leitch and originally transmitted on the BBC in 1983 was dusted down and screened to a packed audience in Broadcasting House. Gates of Gold is set in rural Co. Antrim back in 1959. 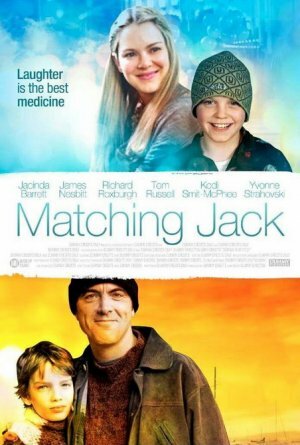 Fourteen year old Grace lives with her foster parents on a farm. She has a learning disability, but helps out on the farm. Her Dad has allowed a travelling tent mission to set up in one of his fields. The film mimics Grace’s sporadic speech, starting very slowly, with noises of the countryside and very little dialogue. There’s real attention to detail that reminds me of visiting relatives’ homes in the Glens of Antrim: the farm house clock ticking away loudly in the background of every downstairs conversation. Intrigued by the sound of an organ, Grace explores the “canvas cathedral” and is befriended by the youthful George McQuiston (Bryan Murray who later played Brookside’s Trevor Jordache), even joining in to sing along as he practices his playing. On the mission’s first evening, Pastor Eric Kells speaks to a full tent. He cites the 100th anniversary of the 1859 revival in the region. While the opening music was joyful, his message is serious and hell-bent. George is invited up to give his “powerful” testimony. The rhetoric’s emotion is turned up along with the accompanying organ music and singing in the background as Pastor Kells begins the altar call. Grace stands to go forward but her parents restrain her and make her sit down. But she’s a changed girl, tackling her tasks around the farm with renewed enthusiasm and a smile on her face. There are numerous tensions throughout the well-crafted 68 minute television play. Grace’s mother is very hard on her foster child – “I’m determined the while that child is in my care she’ll be protected from herself” – and clashes with her more laid back husband. Pastor Kells and George aren’t a happy partnership, and fall well short of the ideals they preach. Kells is found of “the devil’s buttermilk” and George is passionate about more than just music. And finally, the straight-laced local Presbyterian minister is unimpressed with the “lurid import” from across the Atlantic that is leading his congregation astray. As I watched, I was challenged by the emptiness and joylessness of most of the religion being portrayed on the screen. The tent crusade had emotion and music, but it drove people to faith more through a message about hell than expounding the “laundry of love”. And the traditional indigenous congregation lacked any sensible connection to the modern world with which to engage those sitting on the pews. Or perhaps the old fashioned ways continued to bore people senseless and accurately relate to so little of their lives and communities that your message continues to bypass them and leave them uninspired? 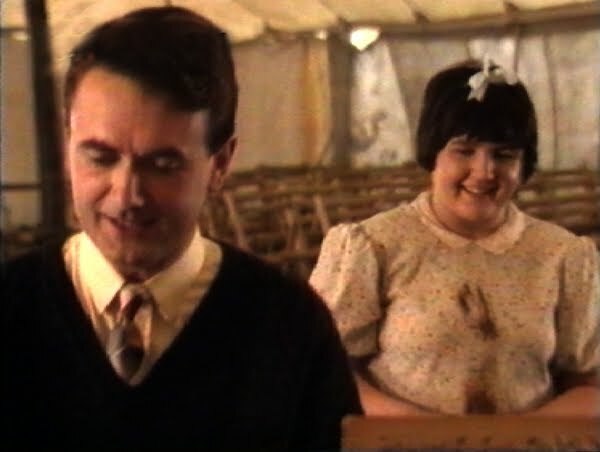 Possibly the most Christ-like character in the programme was Grace’s foster dad. Hard working and hen pecked, he was generous with his land, appreciated his daughter’s help, understood the need to make allowances for her, encouraged her, and tried to keep her out of trouble. He could sense her change in attitude after her tent experiences, and it didn’t frighten him. Of all the characters, he related most honestly to Grace. Sitting in 2011 watching Gates of Gold I wonder how much our attitudes to learning disabilities have changed since 1959. I also wonder whether the 1983 judgement on 1959 Christian services would be any less painful if it looked at today’s expression of church? Like a good play or a good film, it leaves you with more questions than answers. 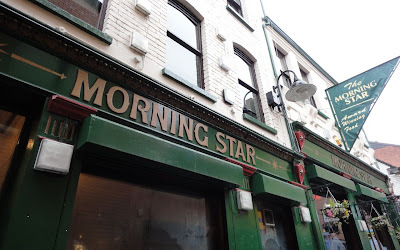 It's been about ten years since we last had a work lunch trip out to The Morning Star. The menu was full of exotic dishes - crocodile and kangaroo steaks. 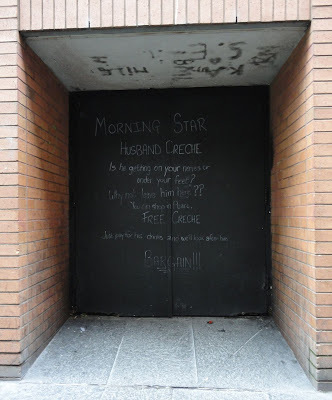 Coming out of In Shops a couple of days ago, we noticed the chalked writing on the fire escape opposite The Morning Star. Someone's been using their imagination for their latest promotion!